A letter from a first class passenger aboard the Titanic to his wife fetched a reported £55,000 at auction on Saturday 17th April at Devizes, Wiltshire, and we’ve found the author in findmypast.co.uk’s passenger lists. The letter was written by an Adolphe Saalfeld, a 47-year old German manufacturer of perfumes living in London and was dated 10th April 1912, the first day of the ill-fated trip. He described in detail a near collision with another liner at Southampton, the lunches and dinner he enjoyed, and the comfort on board. According to the auctioneers, it is the most detailed first person account of life aboard the Titanic in existence. Mr Saalfeld’s passenger records, along with all those who travelled on the Titanic, can only be found on findmypast.co.uk. Saalfeld’s passenger transcript states details of his port of departure at Southampton, and expected port of arrival, effectively verifying the letter. He did in fact arrive at his expected destination of New York, having boarded a lifeboat and been rescued when the ship hit the iceberg. Debra Chatfield, findmypast.co.uk’s marketing manager, said: “When we heard about this amazing letter, we were keen to look up the original passenger record for Adolphe Saalfeld online at findmypast.co.uk. Passenger lists are so useful for finding out when people travelled and to where, for example when and where they emigrated or travelled on business. Search findmypast.co.uk’s 1890-1960 passenger lists today. National hopes of a Brit winning Wimbledon were dashed for another year with Andy Murray’s exit in the semi-finals last Friday. But Murray, at age 22, hasn’t reached his peak, so dreams that he will one day win the title still burn bright. It’s been 73 years since the last Brit won the men’s singles, and in the absence of a British successor Fred Perry remains highly revered. 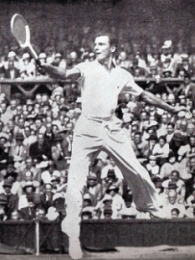 Fred Perry initially made his name as a table-tennis player. He won the 1929 table-tennis world championships and only took up competitive tennis when he reached 18. His transition from table tennis to tennis would prove easy. His exceptional speed and hand-to-eye coordination suited him perfectly to both sports. He won the tennis US Open in 1933, 1934 and 1936, the Australian Open in 1934, the French Open in 1935, and Wimbledon in 1933, 1934, and 1936. To this day he remains the last Brit to win any of the four tournaments. That year they played 61 matches in America: Vines won 32, and Perry 29. Back in England the Brit evened the score by winning six out of nine matches, which left them tied at 35 wins each. Perry died in Melbourne, Australia on 2 February 1995. Even today, some tennis historians rate him among the greatest players of all time. If you have ancestors who emigrated to Australia, you may be able to trace their movements and perhaps those of their descendents using findmypast.com’s new Australian records. These new records include burials, funeral notices and memorial inscriptions for Victoria, which now form part of the findmypast.com Parish Records Collection. There are also records for convict arrivals and names in Victoria Government Gazettes (1858-1900), which have been added to the Other records section. Sir Alexander Fleming, the nobel-prize winning scientist who discovered the antibacterial effects of penicillin, travelled extensively during his lifetime and crossed the Atlantic several times, with the journeys logged on the Passenger Lists. Fleming was born in East Ayrshire, Scotland in 1881. This event, along with many other Scottish records can be found on our sister-site, ScotlandsPeople. Fleming spent the first four years of his career working in a shipping office, but after being left an inheritance by an uncle, he decided to follow the career path of his elder brother, Tom, a physician. After qualifying with distinction in 1906, Fleming joined the research department at St Mary’s as an assistant bacteriologist. He served throughout the First World War as a Captain in the Army Medical Corps, working in battlefield hospitals on the Western Front. Fleming was ‘mentioned in dispatches’ (a report that was issued in the London Gazette, which recorded noteworthy actions) for his conduct in the war. Many soldiers who served or died in the First World War can be found among the findmypast.com military records. During the war Fleming had repeatedly witnessed the deaths of soldiers from septicaemia that resulted from infected wounds, and he became convinced that antiseptics on deep wounds served to hinder a patient’s chances of recovery. When he resumed his post at St Mary’s he resolved to find a better alternative. In spite of Fleming’s undoubted brilliance as a researcher he was also a somewhat careless and chaotic lab technician. It was his carelessness in leaving some cultures unattended whilst on holiday in 1928 that led to the discovery of the world’s first antibiotic, and revolutionised medicine. Alexander Fleming died 53 years ago this month, on 11 March 1955, and his ashes were interred at St Paul’s Cathedral. His death is recorded in the findmypast.com death indexes. Judah Bergman, otherwise known as ‘Jack Kid Berg’, to this day is considered one of the finest boxers Great Britain has produced. Berg was born to a poor Jewish family in Whitechapel, East London, on 28 June 1909. For a young man such as Berg, in the 1920s, professional boxing was one of the few viable routes to a better life. ‘The Whitechapel Windmill’ (as he became known), after entering his first professional fight aged 14, notched up a long string of victories. Despite initially having no formal training, his strength and raw aggression, combined with a natural aptitude for the sport, carried him through. This time Berg stayed a while longer. After an extended unbeaten run, defeating some of the best fighters of the day, he finally got his shot at the world light-welterweight title, held by the American, ‘Mushy’ Callaghan. Berg’s boyhood dream was realised on 18 February 1930, at the Royal Albert Hall in London, when he captured the title from Callaghan via a tenth round stoppage. The victory made Berg a national hero. He successfully defended the title five times, before losing it to Tony Canzoneri, another American, 14 months later. He never won it back, but continued to fight on both sides of the Atlantic with considerable success up until 1945. During a 20 year ring career he amassed a phenomenal record of 157 wins in 192 fights. With Beijing 2008 finished and the countdown to London 2012 underway, we look back at the first time London hosted an Olympic Games, in 1908. The White City Stadium (originally The Great Stadium) was built for the event. It housed a running track, a swimming and diving pool, plus platforms for wrestling and gymnastics. In this, the fifth modern Olympic Games, there were just 24 sporting disciplines pertaining to 22 sports, and only 22 countries competing. Ireland, England, Scotland and Wales were entered as one team, the United Kingdom, but following protests from a number of Irish competitors and with fears of an Irish boycott, the team was renamed ‘Great Britain/Ireland’. Showing its best ever Olympic form, the British team dominated the Games, finishing the overall winner with 56 gold, 51 silver, and 39 bronze medals – dwarfing the second place United States’ tally of 23 gold, 12 silver, and 12 bronze. Many 1908 Olympians can be found on the ancestorsonboard.com Passenger Lists leaving Britain after the Games. The Hollywood star familiar to millions as Cary Grant was born Archibald Alec Leach, in Bristol in 1904. He appears three times in our exclusive Passenger Lists, bound in each instance for New York. We first find Grant in 1920, aged 16, aboard the Olympic. In his company are eight other actors; collectively they comprised the ‘Bob Pender stage troupe’ and were heading to the United States to perform their variety act – Grant himself was a stilt walker. When the rest of the troupe returned to England, Grant elected to remain in the States to pursue a stage career. It proved to be a wise move. Grant ascended the Hollywood ladder with remarkable rapidity. In 1932 he played the leading man opposite Marlene Dietrich in Blonde Venus, and the following year appeared opposite Mae West in She Done Him Wrong and I’m No Angel, two of her most successful films. Grant next appeared in a string of hit comedies and, in the ensuing years, established himself as one of Hollywood’s leading lights – a position he sustained for several decades. In later years he was the favoured star of the notoriously difficult auteur, Alfred Hitchcock. Hitchcock described Grant as: ‘the only actor I ever loved in my whole life.’ Suspicion, Notorious, To Catch a Thief and North by Northwest were all Hitchcock classics starring Grant. Grant died in 1986 with his wife – who, incidentally, was 47 years his junior – at his side. In 1999, the American Film Institute named him the second greatest male American cinema star of all time, just behind Humphrey Bogart. Among the most influential of crime fiction writers is Raymond Chandler. In just seven novels he established his protagonist Philip Marlowe as American fiction’s quintessential private detective. He was also behind some of the finest screenwriting Hollywood has seen. Screen adaptations like Double Indemnity bear testament to his innate ability to write for cinema. Since the 1940s, so many crime and screenwriters have tried to mimic Chandler’s style that, outside his original stories, his characters have become rather clichéd. Within them, however, they have lost almost nothing. ‘Even on Central Avenue, not the quietest dressed street in the world, he looked about as inconspicuous as a tarantula on a slice of angel food.’ – Farewell, My Lovely, 1940. Although an American citizen by birth, Chandler was classically educated at Dulwich College in London, a grounding that shaped him profoundly and made him a confirmed Anglophile for the rest of his days. Upon his death in 1959, but only after a fierce legal battle with a former secretary of Chandler’s, his erstwhile fiancée, Helga Greene, inherited his entire estate.